Americans for the Arts is launching the Arts & Culture Leaders of Color Fellowship in Chicago, Cleveland, and Indianapolis for emerging mid-career arts, culture, and heritage leaders of color. A part of a broader Great Lakes arts leadership initiative in partnership with the Joyce Foundation and American Express, this information session will provide interested 2019 fellowship candidates with a program overview, application instructions, tips for applying, and a live Q & A period. B) relevant tips on how to submit a strong application. Emma Osore is a social architect who builds programs and ecosystems that arc towards justice. She is currently the first Equity in Arts Leadership Program Manager overseeing a new leadership development portfolio focusing on the future arts management workforce. Prior to joining Americans for the Arts, she worked in Los Angeles at the City of Beverly Hills where she worked on projects ranging from strategic planning to public art. Before receiving her Master’s degree she worked as chief-of-staff, community partnerships and philanthropy manager, and founded a student-run community garden at a reconstituted public high school in Washington, DC. Emma got her start working with youth in the juvenile justice system and in the DC Public Schools central office supporting the hiring and evaluation of school leaders. She is currently the co-founder of BlackSpace, a Black urbanist collective, and a mixed media artist. Emma holds a Bachelor’s in Urban and Regional Studies from Cornell University and a Master’s of Public Administration from Baruch College where she was a National Urban Fellow. Emma finds joy in meandering city walks and creates collages and watercolors along the way. The creative class is essential to driving innovation in our cities, yet few creatives are equipped to succeed in today’s global marketplace. Join us on March 15, as we explore the idea of hyperlocalism and learn how creatives can be active participants in their local ecosystems. We are currently existing in the era of the Gig Economy, and the skills that are now needed to affect the creative class and growth look quite different than they once did, especially with investment being pumped into cities and urban neighborhoods. The creative class is essential to driving innovation and changing the future of our cities. Yet few creative professionals feel like they are sufficiently equipped with the business savvy required to succeed in today’s global marketplace. Join Rasu Jilani, Director of Recruiting and Community Engagement at New Inc, as we explore the idea of hyperlocalism and learn how creatives can be active participants in their local ecosystems. Rasu Jilani is an independent curator, social sculptor, and entrepreneur. His work investigates the intersections of art, culture, and civic engagement to raise critically-conscious conversations between artists, their local communities, and the wider public. Mr. Jilani is currently the Director of Recruiting and Community Engagement at New Museum's cultural incubator, NEW INC.
Join us each quarter for conference call with the Mid-Career Network of Americans for the Arts. Every call will feature a Mid-Career Leaders in the Arts and Culture field, discuss trends in the sector, include open space for Mid-Career Leaders to share and receive feedback, have an Americans for the Arts update, and more. Join us each quarter for conference call with the Mid-Career Network of Americans for the Arts. Every call will feature a Mid-Career Leaders in the Arts and Culture field, discuss trends in the sector, include open space for Mid-Career Leaders to share and receive feedback, have an Americans for the Arts update, and more. Mid-Career Leaders from across the arts and culture sector are encouraged to join. All calls will be recorded and archived. Would you like to be featured on one of our quarterly calls? Email Cristyn Johnson to find out more. In this first of two Ask an Expert virtual conversations, attendees will have the opportunity to connect with experts in the field of mural policy development and management. Participants will gain insight into mural implementation, learn about available resources and more! Murals can be a source of pride for communities and come with their own opportunities and challenges for public art program administrators. Mural policy development and management guidelines can be tools for administrators, artists and community members to utilize when implementing a mural. In this first of two Ask an Expert virtual conversations, attendees will have the opportunity to connect with experts in the field of mural policy development and management. Participants will gain insight into mural implementation, learn about available resources and more! Jane Golden has been the driving force of Mural Arts Philadelphia since 1984, overseeing its growth from a small city agency into the nation’s largest public art program. Under Golden’s direction, Mural Arts has created over 4,000 works of public art through innovative collaborations. In partnership with a range of city agencies, she has developed groundbreaking and rigorous programs that work through art to make strides in youth education, restorative justice, and behavioral health. Sought after nationally and internationally as an expert on urban transformation through art, Golden has received numerous awards for her work, including the Eisenhower Exchange Fellowship Award and Philadelphia Magazine’s Trailblazer Award. She is an adjunct professor at the University of Pennsylvania, and serves on the Mayor’s Cultural Advisory Council, the Penn Museum Advisory Committee, and the board of directors of The Heliotrope Foundation. Karl LeClair develops, manages, and promotes public art projects and cultural policies for the City of Boise’s Percent-for-Art Fund and Public Art Program. In collaboration with the Arts & History Commission, City departments, community organizations and citizens, he explores meaningful ways of incorporating artist driven projects into various aspects of the urban landscape. In addition to being an energetic and trusted team player in the Department of Arts & History, LeClair maintains an active artist studio practice rooted in printmaking but explores drawing and installation. LeClair’s work has been exhibited at the Boise Art Museum, Bend Art Center, and Ming Studios. He has a BFA in Art Education, Printmaking, and Art History from Boise State University. Do you look at your Google Analytics data and not know where to start? You’ll learn about important metrics and custom reporting functions as well as get a step-by-step guide on how to track your data over time. Accessibility begins with policies and organizational buy-in from every department – from the Board of Directions to the house staff and ushers. Without a comprehensive plan, true accessibility is disjointed and difficult to achieve. This session will ask participants to look at each department of their organization and how those departments impact the access efforts of the organization. In this workshop, participants will have the opportunity to understand the need for and how to develop a comprehensive ADA/Accessibility plan. Accessibility begins with policies and organizational buy-in from every department – from the Board of Directors to the house staff and ushers. Without a comprehensive plan, true accessibility is disjointed and difficult to achieve. This session will ask participants to look at each department of their organization and how those departments impact the access efforts of the organization. In this workshop, participants will have the opportunity to understand the need for and how to develop a comprehensive ADA/Accessibility plan. A brief introduction of disability from a multi-cultural perspective – including a discussion of the models of disability, disability etiquette and language. Provide participants with sample plans and assessment tools that provide guidance in the development of an accessibility plan. Review best practices for design of organizational policies i.e. staff and volunteer training, grievance procedures, ticket policies, non-discrimination, emergency evacuation and diversity policies. Review how various departments need to be an integral part in the overall ADA plan – including programming, marketing, facilities, and development. Budgeting – how to develop an accessibility budget –an essential component of your ADA plan. The conclusion of this webinar will allow participants to discuss issues, ask questions, and look at next step scenarios. understand the need for having an accessibility plan and leave with a framework to bring back to their organizations to design their own plans. understand that the development of an ADA Plan will serve as a roadmap for the organization as they advance their access goals and objectives. understand that by organizations having a plan in place, implementation of accessibily goals are not overwhelming and many action items are readily achievable. This project is created in partnership with Mid Atlantic Arts Foundation and New Jersey State Council on the Arts, and is supported in part by the National Endowment for the Arts. John McEwen serves as the Executive Director of the New Jersey Theatre Alliance, a service organization for the state’s 33 professional theatres. Prior to the Alliance, John served as Vice President for Development of the New Jersey Network Foundation where he was responsible for a $7 million annual fund. Prior to joining NJN, John served as the Director of Development for Paper Mill Playhouse where he implemented the theatre’s award-winning access services and the Adopt-A-School Project, and was responsible for raising $3.5 million for the annul fund, strategic planning and board development. John is the founder and Chairman of the Cultural Access Network Project, a program of New Jersey Theatre Alliance and the New Jersey State Council on the Arts that assists the state’s cultural organizations as they make their programs and services accessible to individuals with disabilities. John serves as a trustee for ArtPRIDE New Jersey, Center for NonProfits, Montclair State University’s College of the Arts, and the Fund for the New Jersey Blind. John’s awards and achievements include the first Excellence in Accessibility Leadership Award from the Christopher Reeves Paralysis Foundation and the Kennedy Center for the Performing Arts, The Robert Smyth Outstanding Professional Fundraiser Award from AFP/NJ Chapter, Ann Klein Advocate Award from the Community Health Law Project, Award of Excellence from Passage Theatre, the Governor Kean and Byrne Advocacy Award from Paper Mill Playhouse, a Citation of Excellence from the New Jersey State Council on the Arts, and the Community Service Award from the New Jersey Department of Recreation. Beth Prevor is a co-founder and Executive Director of Hands On, an arts service organization that advocates for access to >span class="apple-converted-space"> arts for the Deaf community and audiences with disabilities. For the last 30+ years, Hands On has been providing access for the Deaf and hard of hearing communities of NYC through sign language interpreted theater at some of NYC’s most prestigious theaters including The Roundabout Theater Company, The New York Shakespeare Festival/Public Theater and The New Victory Theater. She is the 2015 recipient of the John F. Kennedy Center’s Excellence in Accessibility Leadership Lifetime Achievement award. The "Ready Now!" Toolkit (http://www.ohsu.edu/xd/outreach/occyshn/upload/ReadyNowToolkit.pdf) from the Oregon Office on Disability and Health is for people with disabilities and emphasizes independence, allowing each person to address his or her specific needs. The Get Ready! Toolkit (http://dhss.alaska.gov/dph/wcfh/Documents/disability/GetReadyWebaccessible.pdf) from the Alaska Health and Disability program will help you prepare for an emergency. Alaska also developed the Get Ready! Toolkit webinar(https://dhss.adobeconnect.com/p2an0b2anso/) to assist Alaskans and others with disabilities and their caregivers in putting the Get Ready!Toolkit into action. Three part series for Artists. In this workshop, artists will be given the necessary tools to make the leap from working in the isolation of the studio to working in a collaborative, large scale setting. The intent is to give artists the confidence and knowledge needed to move their career into public art. Slide show highlighting 10-15 different types of public art projects including full descriptions. Responsibilities of a public artist and public art project manager. Describing the collaborative process of project development. How to apply, write a letter, graphically and verbally present your work in an application. What to include in a letter of interest and how to present your work in an interview. Artists experiences. The two artists describe how they began working in public art and the relationship of their public art to their previous work; show slides of previous work, describe specific interest in applying for the public art project/s they have participated in, and how they presented themselves and their work to get their first public art project. Working in the studio allows an artist to create his/her own schedule, budget, and system for creation. Once an artist moves into the highly collaborative field of public art, huge changes are introduced. In this workshop we will cover how to work with other professionals, where to find help when needed, and the roles of each professional/ stakeholder as a project moves forward. Getting started -learning from stakeholders including community members, architects/designers, and reviewing bodies; the roles of team members and lines of communication (project manager, contracting officer, architects, engineers and other consultants). How to present your ideas—what is expected during concept development stage. Artist experiences - how and what we learned from community members and stakeholders, and content/resources; how we leveraged architecture -the development steps of a project. 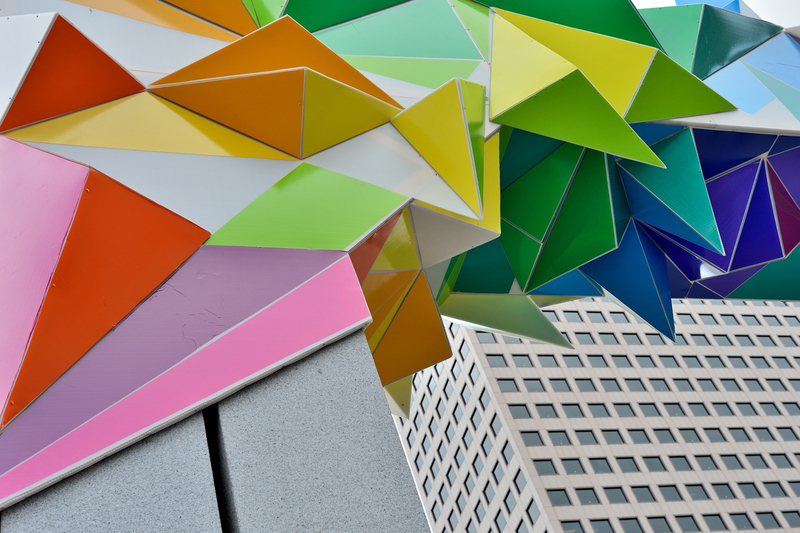 Unlike traditional studio materials, public art requires that one look at maintenance, durability, and presentation in a new light. Materials research often requires looking at infrastructure rather than museum work and speaking with contractors rather than other artists. The cost of these materials can be shocking to artists who've traditionally worked with studio materials. In this workshop, we'll cover strategies for working with materials and budgets on the public art scale. Moving from concept into buildable design - considering durable materials, researching fabrication techniques, trouble shooting possible problems. How to structure your budget and time; cost estimating, collaborating with fabricators. Creative collaboration: Integrating your work into the construction schedule, resources and credits. Working with other collaborators: conservator, engineer, architect, graphic designer, historian, etc. Artist experience: What I learned in building my artwork, problems and how I solved them, what I would do next time. Cultural planning is a great tool for bringing a diverse array of stakeholders into alignment around arts and culture priorities. Well-constructed processes that are community- and data-driven can yield impressive long-term results that foster the health and vitality of your community’s arts and cultural assets and create opportunity for broader community development. Join Arts Cleveland staff as they discuss their new resource to the field, Elevating the Influence of Arts and Culture: A Cleveland Playbook, which documents their cultural plan journey, including how they engaged community members and elected officials, built strategic partnerships, and their frustrations and triumphs along the way. Cultural planning is a great tool for bringing a diverse array of stakeholders into alignment around arts and culture priorities. Well-constructed processes that are community- and data-driven can yield impressive long-term results that foster the health and vitality of your community’s arts and cultural assets and create opportunity for broader community development. Join Arts Cleveland staff as they discuss their new resource to the field, Elevating the Influence of Arts and Culture: A Cleveland Playbook, which documents their cultural plan journey, including how they engaged community members and elected officials, built strategic partnerships, and their frustrations and triumphs along the way. Attendees will learn the development and implementation of Arts Cleveland’s cultural plan. Attendees will learn tips and tricks as they consider starting their own cultural planning process and strategy. Attendees will learn some immediate next steps they can take to set themselves up for cultural planning success. Megan Van Voorhis grew up in Flint, Michigan. She completed a BFA in dance from The Ohio State University in 1998. Van Voorhis began her professional career at the Royal George Theatre Center in Chicago, Illinois. She returned to Ohio in 2001 to pursue an MBA at Case Western Reserve University. In 2003, Van Voorhis joined the program staff of Community Partnership for Arts and Culture (now Arts Cleveland). She became President and CEO in January 2018. Van Voorhis taught in the arts management program at Baldwin Wallace University for 6 years. She serves on the board of Ohio Citizens for the Arts, is Chair of the Mental Health & Addiction Advocacy Coalition (Northeast Ohio Hub) and advisory committee member for MetroHealth’s Arts-In-Medicine program. She is a member of the 2014 class of Crain’s Cleveland Business 40 under 40 honorees. As Director of Programs and Services, Valerie ensures quality, relevance and alignment of the organization’s programmatic offerings and manages the organization’s brand. In doing so, she manages a range of activities at Arts Cleveland including program implementation, online presence and design direction. Schumacher received her Bachelor of Arts in Art Studio, Entrepreneurship and Arts Management from Baldwin Wallace University and studied photography in Perugia, Italy, at the Umbra Institute. She was the first among "Emerging Artist Booth” participants to receive an honorable mention at the Tremont Arts and Cultural Festival. She graduated from YWCA Cleveland’s 2012-13 Leadership Boot Camp and continues to find ways to grow and support the growth of those around her.